Do You Know How to Care for a Lawn? If you are like many New Jersey homeowners, September’s arrival has you thinking about fall lawn care. Autumn brings cooler temperatures and rainfall that are perfect for pre-winter preparation. During the fall season, grass is busy taking in nutrients, water and energy to sustain it during dormancy. A little extra work now will reward you with a beautiful lawn in the spring. The following tips will help. Even though your lawn will not be growing as quickly, it still requires regular cutting. In late fall, you should drop the mower blades to the lowest level for the final two cuttings of the year. This will allow the top of the grass to get more sunlight and will reduce the amount of browning over the winter. It is best practice to not remove any more than one-third of the grass at any time. Lower the blades gradually. In addition to mowing, you should continue to water the lawn as needed. You will need to aerate your lawn to allow water, fertilizer and oxygen to get into the roots. An easy way to do this is by renting a gas-powered aerator that will pull up plugs of dirt from the soil. If you have a larger property, you may require the services of a landscaping contractor to complete the job. 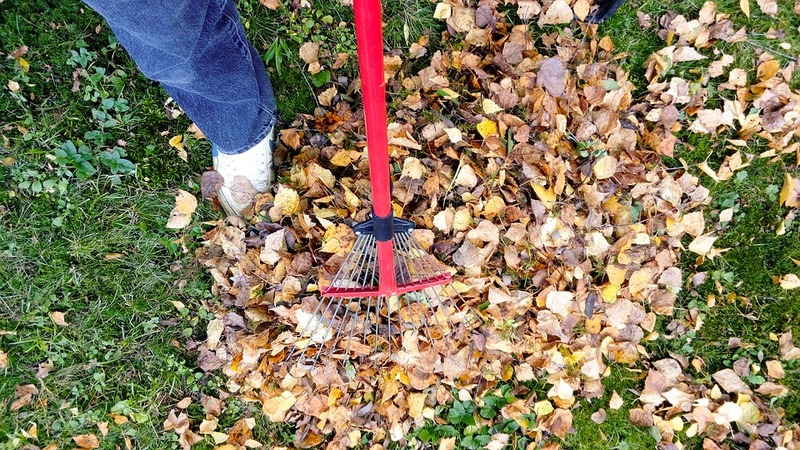 Most homeowners do not like to rake leaves because it is tedious and time consuming, but not doing so will cause problems for your lawn. If you wait until all the leaves have fallen to the ground, they will be very wet from rain and dew and will turn into a matted mess that is difficult to remove. The thick leaf carpet will also prevent oxygen from getting to the grass, causing it to suffocate or breed fungus. Always rake leaves as soon as possible. Autumn is the best time to apply fertilizer to your lawn. Even though the grass blades are not growing as quickly, the roots and plant stems just below the soil surface are very active. Applying fertilizer in the fall will provide extra nutrients for the grass during a period of high absorption, giving the lawn a boost for spring. If your lawn has a bald spot or two, fall is a great time to fix this problem. The best approach is by using a special lawn mixture that contains quick-start fertilizer, mulch and grass seed. After you loosen the soil of the bald patch, put down a thick covering of the lawn mixture and and lightly tamp it down. Give the area a thorough watering and continue to do every other day for 14 days. In the spring, the patch will fill in with healthy new grass and blend nicely with the rest of the lawn. Common lawn weeds like dandelions can be hard to eradicate, but autumn provides a window for you to get ahead of the problem. Like grass, weeds also switch to absorbing energy in the fall, which means they will be extremely receptive to any herbicide you apply to the lawn. Doing this now means you will not have weeds when spring arrives. Most weed killers must be applied in early or middle autumn on days when the temperature is at least 60 degrees. Following the steps above will ensure you have a rich, green healthy lawn in the spring. If you have any questions about fall lawn care or simply need some help, please contact our company to help with your landscape maintenance in NJ. Great post! I read your blog fairly often and I always learn something. I shared this on Facebook and my followers loved it.